Tokyo Elects Yuriko Koike As Its First Female Governor : The Two-Way Japanese voters have elected Yuriko Koike as the capital's first female governor. She's taking the helm amid high-pressure preparations for the 2020 Summer Olympics in Tokyo. Former defense minister Yuriko Koike waves at passersby during her campaign rally for the Tokyo gubernatorial election in Tokyo on Friday. Japanese voters have elected Yuriko Koike, 64, as the capital's first female governor. She's taking the helm after her predecessor resigned following a funding scandal, amid high-pressure preparations for the 2020 Summer Olympics in Tokyo. She triumphed over two main rival candidates. And while vote counting is still ongoing, Japanese state broadcaster NHK reports that she is "certain to win" based on exit polls. Koike's "biography is unusual for a Japanese politician, even apart from her gender," as The New York Times reported. "A divorced former newscaster, she attended a university in Egypt and speaks fluent Arabic." "It's the second time in a handful of years that Tokyo's voters have elected a new governor after a scandal — Koike's two most immediate predecessors both resigned in disgrace over misuse of public funds. Koike is expected to repair a tarnished image leading up to the 2020 Olympics; Tokyo's hosting bid has been plagued by stadium construction delays, plagiarism in its logo design, and accusations of bribery." And while Koike is a member of Prime Minister Shinzo Abe's Liberal Democratic Party, she announced her candidacy before securing the party's approval. As Reuters reports, this angered the ruling party and it "drafted [rival candidate Hiroya] Matsuda, 64, who once served as governor of a rural prefecture" to run against her. Opposition candidate Shuntaro Torigoe, a journalist, also contested the election. As the Times reported, "Koike was widely seen as the most right-leaning of the three leading candidates." The role of Tokyo's governor "roughly combines duties of an American mayor and a state governor," according to the Times. The city has "a population of more than 13 million and an annual budget bigger than Sweden's," as The Associated Press reported. During her campaign, Koike pledged to "promote urban development while giving consideration to the environment," as NHK reported. 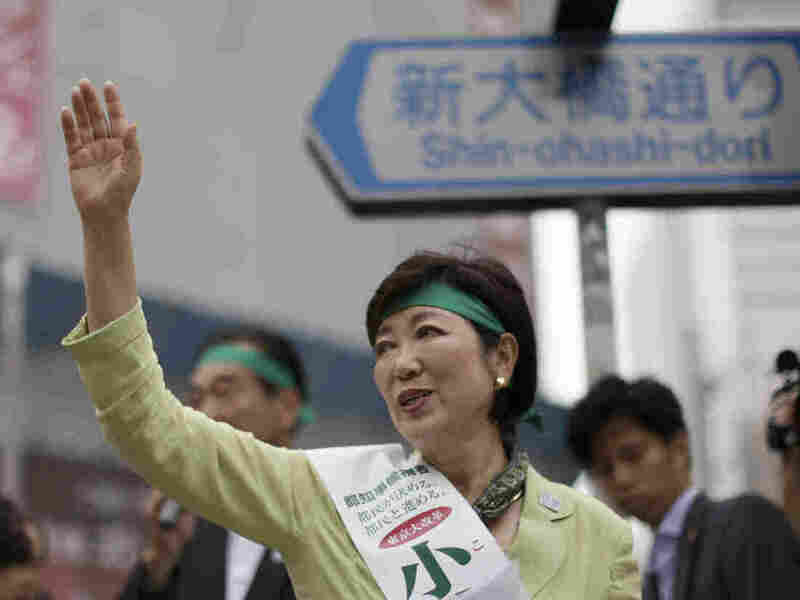 According to the Wall Street Journal, while she served as environment minister in 2005, Koike was behind a successful environmental program called "cool biz." That's when "government officials were told to shed their ties and often their jackets during the summer months so that thermostats could be set at a higher level," as the newspaper reported. "The concept was widely adopted by private employers, and now most men go without tie and jacket in the summer." One of her first task as governor will be to travel to Rio de Janiero for the Olympics, "as the representative of the city that's hosting the next games," as the AP reported.